Why would you ever want to use your smartphone while you are riding your motorcycle? Well, many motorcyclists will agree that GPS units designed for such vehicles aren’t that good at what they are supposed to do. That’s the case with many Garmin models, but the truth is that it’s even worse with those developed by other brands. The main issue with GPS models is their interface. Technically, navigational devices should be better at telling you which way you are supposed to go compared to smartphones, and that’s because they use signals coming from satellites – they do not depend on an Internet connection. Unfortunately, the manufacturing companies are virtually unable to make their gadgets user-friendly and capable of loading fast. That’s where smartphones take the cake. Even more, you’re supposed to download and update maps every once in a while if you use a GPS – the old ones might be incorrect, meaning that you might end up trying to go down a road where motorcycles aren’t allowed, for example (although they used to be). For that, you need software on your computer, and with a program like BaseCamp (by Garmin), you’re going to have a lot of trouble transferring the new maps to your GPS – because it’s not user-friendly at all (it wasn’t at the time this article was written, anyway). Another advantage of navigational devices is that most of the modern ones today come with touchscreens that you can use even while you are wearing gloves. Furthermore, their displays are often waterproof, so there’s virtually no need for you to utilize a cover. Naturally, this is not a pro that your smartphone can offer. 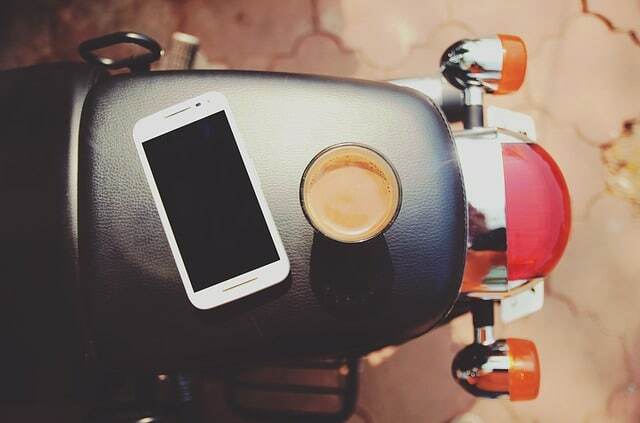 Let’s look at some tips you might need to get the most out of your smartphone while riding your motorbike. To use your smartphone as a GPS, you will require a place to mount it, a motorcycle smartphone mount holder, a power source, a headset, as well as a navigation app. When it comes to software, you have loads and loads of options, but some of them are better than others. You could use the usual mapping apps like Apple’s Maps or Google Maps, but these two will never show you any information regarding traffic. Naturally, they are also subject to all sorts of modifications, so you might end up wanting to choose a route where you aren’t allowed with your motorcycle. A good thing about these, however, is the fact that they are free. What’s more, you can even download the maps of a specific area and use the navigation even as you aren’t connected to the Internet. Then, you have other alternatives such as Scenic, Garmin StreetPilot, Navigon MobileNavigator, Motion-X Drive, CoPilot Premium USA, and many others. Many motorcyclists prefer to use Waze nowadays because it is reliable and community-based. Not only is the traffic information up to date, but you also get alerts from other drivers/riders in the area you are transiting. They can offer you valuable information with regard to police radars, whether there are blockages in the road, and other things like this. Needless to say, that’s not something that a regular GPS can assist you with. Since smartphones can get quite expensive (especially those made by Apple), the last thing you might want is for it to pop off your bike and disappear into a canyon. 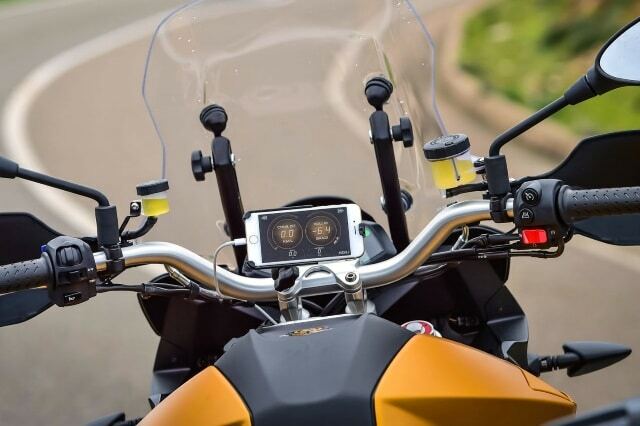 A quality motorcycle smartphone mount can help you prevent that. Some of them are universal whereas others are designed specifically for certain smartphone models. In most of the cases, these mounts are secure, as well as easy to use, so you won’t have a hard time installing them. Just make sure that they are compatible both with your smartphone and with your handlebar – don’t get one for bicycles instead of one made for thicker handlebars (for motorcycles). Something else that you are likely to require is a case that can protect your smartphone from the elements. Unfortunately, there is no type of phone nowadays that’s truly waterproof. Sure, there are several that are water-resistant and they might do a good job in the rain, but what are you going to do when the screen is all watery and you can’t see anything? A good case can come with a mini-shield that can protect part of the display, allowing you to understand what you’re looking at even in the pouring rain. Here is where smartphones might be inferior to GPS units. Most GPS units come with decent batteries which can make it possible for them to last for at least a couple of hours (or more, depending on the model). However, that doesn’t happen with phones. The batteries in our smartphones last for a good amount of time precisely because we don’t talk on them for hours and we (in theory, at least) don’t use our smartphones to be on Facebook or Instagram 24/7. If you do have that habit, though, you might notice that you can lose power quite fast. There are two choices when it comes to supplying your smartphone with power. One of them is to connect your mobile gadget to your motorcycle battery, and that works in most cases. Nevertheless, if you’re one of those motorcyclists who would rather be safe than sorry, we also recommend getting a power bank. One issue that you have to address is how you are going to manage the wiring. It’s pretty uncomfortable to see all sorts of cables dangling about, especially when you’re riding at higher speeds. You can partially solve this issue if you decide to use a hub of some sort. Depending on the navigation app that you have chosen, you are going to need a headset or not. With Waze, you won’t receive any audible instructions, so there’s no need for that – especially if you’ve gone down the same route before and you’re likely to encounter no surprises. You can get a Bluetooth helmet or one that’s Bluetooth capable. You can get a headset for around one hundred to two hundred dollars (with the latter being a lot better than the former). Some motorcyclists prefer using Sena headsets while others go for Cardo ones.